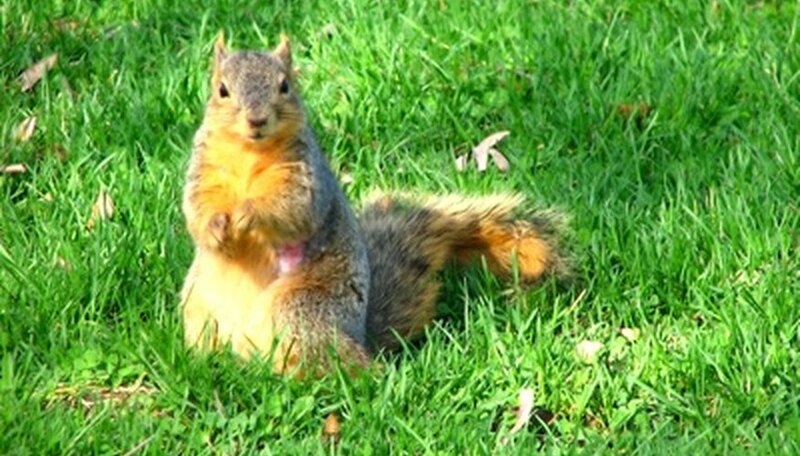 Vegetable gardens are prime food sources for squirrels in urban and suburban areas. Unfortunately, squirrels can gain access to gardens from almost any direction. One method of deterring squirrels is to fence off the garden completely. This can be accomplished by building a chicken wire box around the garden that is embedded in the ground. Set a stake at one corner of the garden. Hook the measuring tape to the stake. Walk backward the length of one side. Write the measurement down. Walk back up to the stake. Hook the measuring tape so you are facing at a right angle to the previous measurement. Walk backward the length of this side. Write the measurement down. Repeat this process as needed by moving the stake to another corner, using it as the pivot point for each right angle. If your garden is a square or rectangle, you only need one set of measurements as the opposite corner will be the same measurements. Place a marker stake or flag every 4 feet on each side of the garden. The posts to hold the chicken wire will be placed at these locations. Set a post at one corner of the garden. Have someone hold the post perpendicular to the ground. Pound the post into the ground to a depth of 2 feet with the hammer. The depth prevents the post from shifting. Repeat this process with each post until you have encircled the garden. Dig a trench on the outside of the posts 6 inches deep by 6 inches wide. Dig the trench around the perimeter of the garden. Line up the roll of chicken wire parallel to the first post. Find the end of the wire and line that up against the post side facing away from the garden. Make the ends flush with the edge of the post. Place the fence into the trench so that the bottom of the wire bends to cover the bottom of the fence and inside edge of the fence. This will keep squirrels from digging under the fence. Continue with this step while setting up the fence around the garden. Use a wire connector at the top and bottom of the post. Insert the ends of the wire connectors through the chicken wire so they are around the post holding the wire to the post. Wrap the connectors around the post and pull tightly. Trim the excess off each connector. Unroll the wire fencing to the next post. Pull the wire tight to keep it from sagging. Have someone hold the wire tight as you connect the wire connectors as directed in Step 4. Continue this process for each post in the fence until you are at the last post. Extend the fencing to the starting post and cut the fencing off from the roll. Clip an eye bolt to the top and bottom of the open end of the fence. Clip the other end of both eye bolts to the first section of fencing. This creates a gate to enter the garden. Have someone hold the roll vertical to the top of the fencing at one corner. Tie the end of the roll to the top of the fence with wire connectors. Unroll the chicken wire across the garden to the opposite side. Cut the wire where it meets the top of the fencing. Tie the two panels together with connectors. Repeat this process until the entire garden is covered. You should now have a boxed-in garden.